This is the second of a three-part presentation of Lórien scenes. Screencaps follow a brief discussion, plus a copy of the dialogue for the film scene. 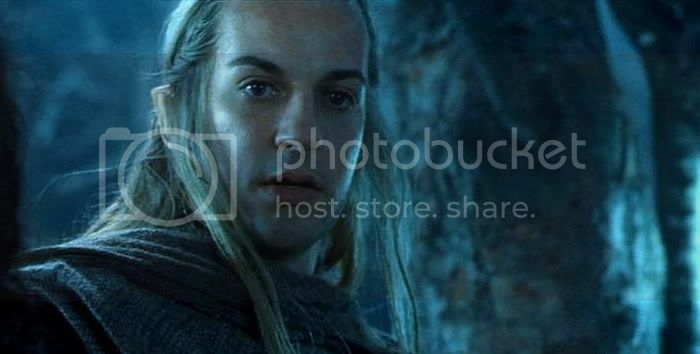 The series of caps below comes from the Extended Edition of FotR, occurring after Frodo hears Galadriel’s voice and the Company is intercepted by Elves, but before they are seen entering Caras Galadhon, climbing the stairs to be presented to Galadriel and Celeborn. This restored segment does several things I like, the primary thing being the extending of time and space. In the theatrical version, the Fellowship is accosted in the afternoon, and, since it is night in the scenes with Galadriel, they appear to reach Caras Galadhon on the evening of the same day. In the EE, the daytime scene in which the Elves hold them at arrow-point is followed by a night scene (caps below), in which Aragorn begs for sanctuary in Lórien. While it is still night, Haldir orders them to follow him. Shots of the Fellowship following Haldir through sun-lit woods come next. They reach an opening on a hill, where they are shown a distant view of Caras Galadhon, bathed in sunlight. While the EE scene does not convey the days and distance travelled in the book, it does give viewers the sense that it takes longer to get to the heart of Lórien than an afternoon’s march. 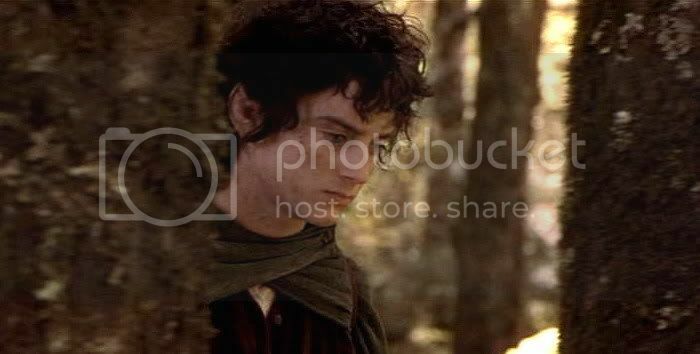 They march that distance in silence, looking about them as they walk along, but Frodo looks extremely tired, even despondent. In fact, he looks more weary and dispirited than at any other time in the trilogy, except perhaps on the plains of Gorgoroth. It is in this sequence, this little glimpse of tired-to-the-bone Frodo, that I see a reference to the excerpt I quoted in the “Mithril shirt” post. 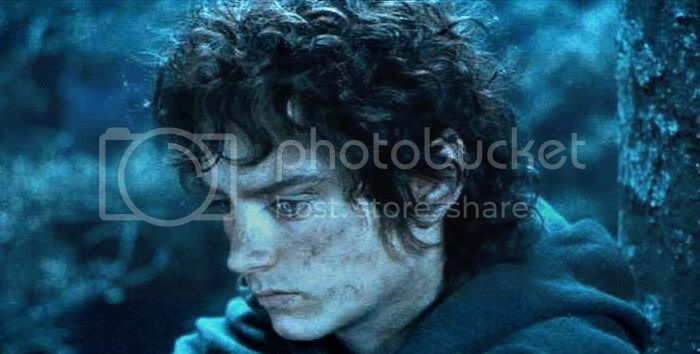 In that passage, Tolkien related Frodo’s silent suffering after Moria: exhausted and in pain from untreated wounds to body and heart, he and Sam struggle to keep up with the Company as they press on. Every time, this tiny bit of footage brings tears to my eyes. Back to the night scene in which Aragorn and Haldir argue (Gimli unable to suppress his little insult), it shows Frodo catching sidelong looks from his companions, looks which seem wary, even judging: as if they, too, might be saying in their hearts, “You bring great evil with you—to us—Ringbearer.” Frodo looks too tired to resist the subtle waves of negativity, real or imagined. I think it’s an inspired turn on the part of the writers to let Boromir be the one who notices and offers consolation. 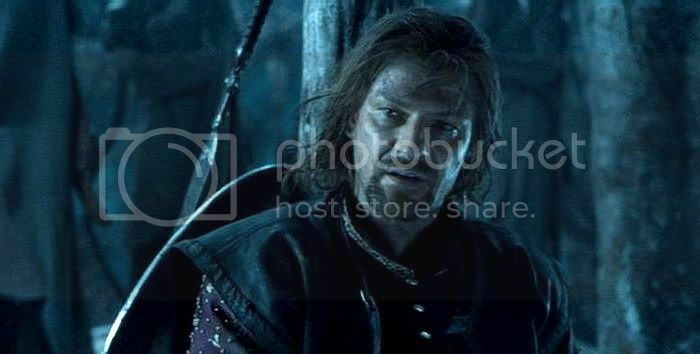 Echoing his remark at the Council (“You carry the fate of us all, little one”), Boromir speaks to Frodo and comes to sit by him in his isolation. Is it just the Ring drawing Boromir? It could be; his desire to use the Ring for Gondor has been made plain almost from his first appearance on screen. And the set-up—Boromir coming to Frodo when he is distressed and isolated to offer comfort and advice—foreshadows the one in the woods of Amon Hen. Yet I don’t think this scene is played that way. It’s played as though Boromir truly feels for Frodo, not that he’s just softening him up, hoping to persuade Frodo out of the Ring later. Not only does this show of compassion from Boromir make for a nice little scene in the EE, it makes the scene to come, of Boromir's attack upon Frodo on Amon Hen, that much the greater and more tragic. If only for that reason, I’m very sorry this scene did not make the theatrical cut. As for Haldir’s line as he points to Caras Galadhon, well, it’s not that Craig Parker is terrible as Haldir, he’s not. He has some very good moments. His scenes in TTT are all excellent. But the way he is directed to say this line: the swell of music under it, the beatific smile bordering on the goofy: it makes me laugh. Laughing is good, but not if it is at the expense of the quality of the film and the fine scene that came before it. If that moment hadn’t made the theatrical edition (or the EE), I would not been grieved. Film Scene from the EE: Haldir is persuaded to let the Fellowship enter Lórien. Screenplay transcriptions from The Seat of Kings and Daniel's LotR Page. Aragorn: [To Gimli] That was not so courteous. Haldir: [To Frodo] You bring great evil with you. [To Aragorn] You can go no further. Boromir: [To Frodo] Gandalf’s death was not in vain. Nor would he have you give up hope. 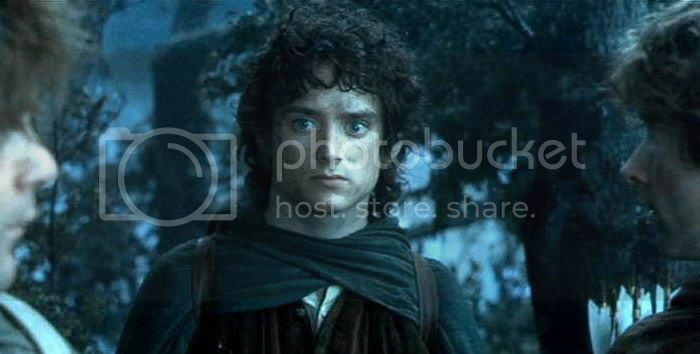 You carry a heavy burden, Frodo. Don’t carry the weight of the dead. Haldir: [To Frodo and the Company] You will follow me. Haldir: [With light in his eyes] Caras Galadhon, the heart of Elvendom on earth, realm of the Lord Celeborn and of Galadriel, Lady of Light. 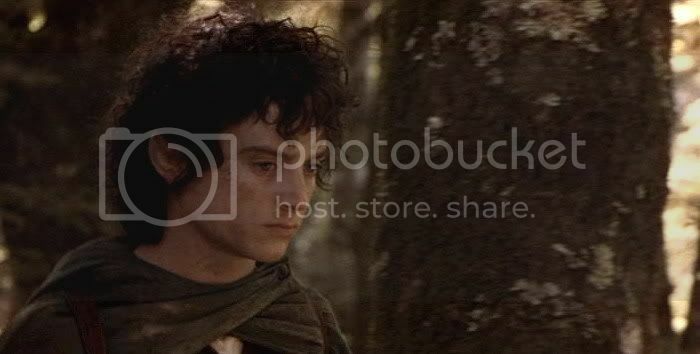 Indeed, yes, Frodo looks despondent on that march. Do you know what I immediately thought when I saw those scenes? Two things: (1) ANY death march, and, (2) Christ being hauled before Pilate (prepatory to being judged and led away to be killed). I also think that he looks a bit angry, and I can't blame him in the least if he is. But I should think, given the events that have just occurred, the horrible trip through Moria, and esp. the loss of Gandalf, that he would be very despondent. What truly broke my heart was when Sam turned and looked at him as if in doubt or suspicion ....or even as if to say.... "by knowing and being with you, I am inviting my own death". I thought that was rather un-Sam-like. (Worse yet was that same moment being repeated in Frodo's Mirror scene). How terrible it must have made Frodo feel: on top of likely knowing that now (without Gandalf to help and protect him) he very surely would die in the commission of his promise, his own friends and kin, his companions sworn to him, doubted and mistrusted him because of what he bore. A real catch-22. Those are strong parallels, Jan, affecting ones, too. Poor Frodo! Yes, the film Lorien sequence really does put Frodo through the mill. It's only in the EE sequence, too, that all this is added to the general level of spookiness in Lorien. In the theatrical, Haldir does tell him he brings evil there, but one can dismiss that as Haldir being huffy. 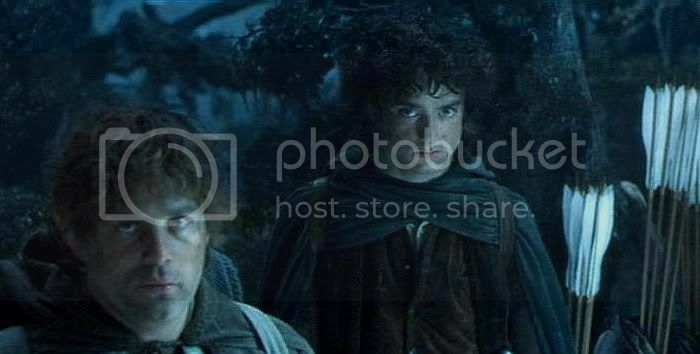 Frodo being looked at askance by his friends is quite another matter. Have a wonderful night with the sweetest of dreams, my dear. Thanks, Julchen, I'm just back from work myself. I hope you had a decent day at work. These are among the most beautiful pics of Frodo == dirty and weary and grieved and yet so beautiful inside and out. And I think you're absolutely right. Boromir was honestly trying to console Frodo in that scene. I didn't see anything calculating about it...and I just love that scene. I just love that BOromir was the one to do that. Thanks, Claudia. I didn't see anything calculating in Boromir, either. What a shame the Ring got to him. I love the way Sean Bean played Boromir. He made a rather unlikeable book character into a beautiful soul. These are beautiful caps, and I especially love the blue-tinted scenes. Plus, thank you for the Elvish translation! I've been wondering for years what Aragorn was saying to Haldir. "Movie" Boromir is definitely one of those things that PJ & Co. got right. Sean Bean's interpretation, and interaction with the hobbits in many scenes, really peels the layers from his character so you can see the man beneath the Man. Shirebound, I just commented to Claudia how much I appreciated film Boromir. I was listening to the BBC radio production again today (on headphones) while I worked, a production I really love, but, oh, my, is the Boromir bad. A loud-mouth boor, a complainer, and show-off, one wonders how the rest of the Fellowship (in that production) could put up with him. Sean Bean with the filmmakers made Boromir into a memorable, tragic character, worthy of love and compassion. I like to think Boromir might be thinking of Faramir here, who's so misunderstood and little-valued by Denethor, and he reaches out to Frodo as he would reach out to his brother. I love the golden light there, that makes his face look at once young and old, marked by the suffering he's endured. That's movingly put. He does look like he's carrying the cross a bit there. He really looks wretched, or, as you better put it, "marked by suffering". 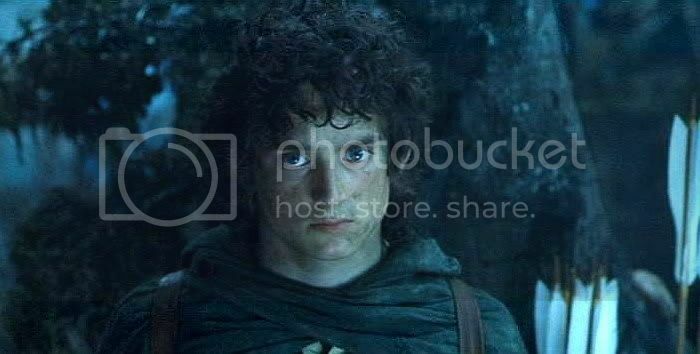 I think you are right that it's only Frodo's self-accusing imaginings that makes those looks from his companions seem so perjorative. 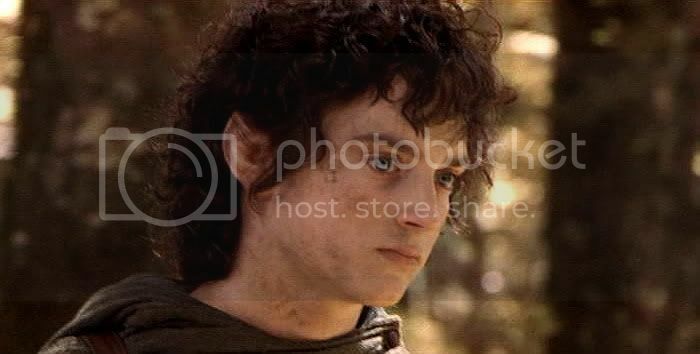 But the film definitely seems to show Frodo understanding their looks as judgemental and accusing. I thought Jan's comment at the top depicted well how hard on Frodo it would have been to have received those looks, interpreting them that way. I loved Boromir in that scene; in fact I find Boromir's character more interesting in the film than in the book; in the film you really can see a very good man being defeated by the Ring, while in the book he's irritating from the start; Tolkien often says he's a man of great merit, but Sean Bean managed to make the spectators feel it. I didn't cry when I read Boromir's death, but I did while watching the scene in the theater. I was just agreeing above with Claudia and Shirebound about the merits of Sean Bean's Boromir. He really made that role beautiful, and enriched the over-all story because of it. This is one of the rare instances in which I thought the film version clearly surpassed the book. I now read the book with the Bean performance in mind, but it really isn't there. When I re-read the Annals of the Kings and Stewards last week, it seemed to confirm that Tolkien did not mean to portray Boromir very sympathetically, since he compared B. to King Earnur. Earnur was a man Tolkien could call fearless in battle and a great champion, but he had no love for him as a man, and did not think he was a good king or leader of armies -- too concerned with pursuing glory in contests of arms, making him heedless of the greater good. Film-Boromir bears little resemblance to Earnur: a good leader, apparently loved by all, including his men. The whole Lothlorien scene is one of my favourites from FOTR...the ethereal blue lighting and Frodo's enormous eyes and beautiful face were what captivated me in the first screening I saw !! Here I still am, six or seven years later, still captivated !! There was never one quite like Frodo..
Wendy! Hello! Yes, as I recall, you were a big fan of Frodo in the Lorien blue scenes. Who wasn't? Whiteling did a beautiful drawing from those caps that was always being posted in the threads. Another beautiful series of screencaps, Mechtild. Oh, I love these EE Lorien scenes. Frodo's grief and guilt is written so clearly in his subdued, almost detached demeanour. 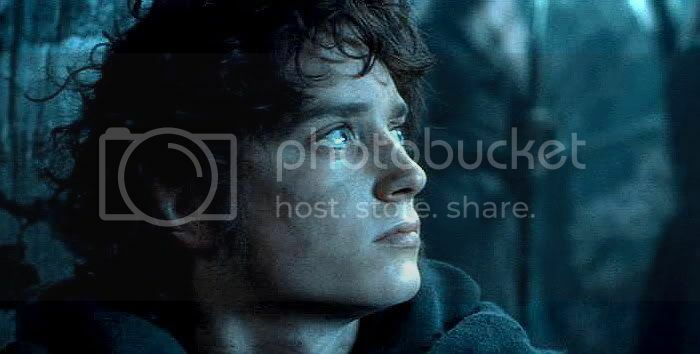 I do not believe his friends' glances are intentionally accusing, but I can understand why, after everything that has just happened, Frodo would think - or imagine - that they are. The little scene in which Boromir attempts to console him is very touching, I think. I agree. 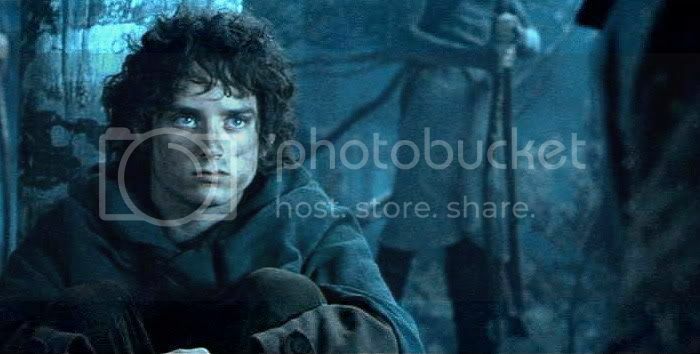 Frodo seemingly has the weight of the world (or Middle-earth, at least) on his shoulders here. My heart weeps for him. Thank you so much for the pictures and your commentary - always so articulate, thoughtful, and often enlightening. I'll look forward to Part 3. Thanks for stopping in, Blossom. 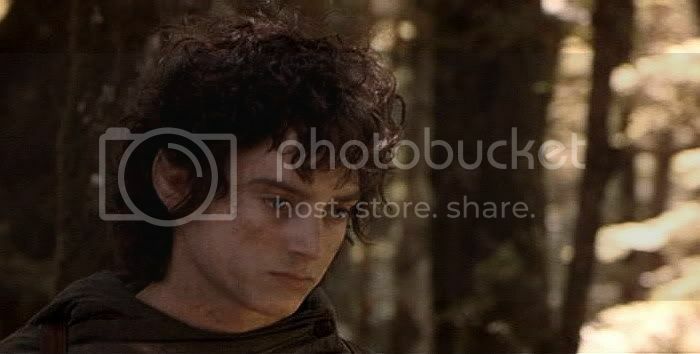 I'd say most viewers would agree that Frodo's companions weren't actually thinking bad things about him, but that Frodo *felt* those looks that way, due to his own inner misery and turmoil. Still not recovered from the first grief, and guilt over Gandalf's fall (not at all Frodo's fault, but he's bound to feel somewhat responsible, just being Frodo!). Yes, the trudging scene, all five seconds of it, is great. It's a measure of him as an actor that he could convey all that in just a few frames (with significant help from the excellent technical artists, of course). That last 'anonymous' post was me - Blossom. My goodness, but Film Fro is beautiful. So much expressiveness in that face! All his journey is written there. But the lovely touch was Boromir's kindness, wisdom and gentleness with Frodo here. Meep. Wibble. Swoon. I do absolutely love the Lothlorien sequence in the film though, canonical quibbles aside. Fabulously well done. And as Wendy says, utterly utterly enchanting. I thought this moment was excellent, actually. 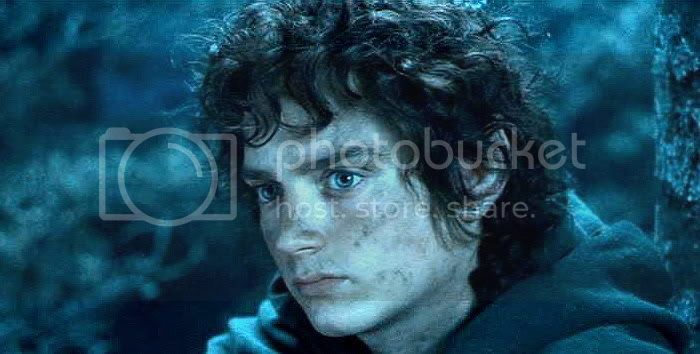 But I thought and think that PJ didn't mean those looks to be accurately perceived by Frodo. 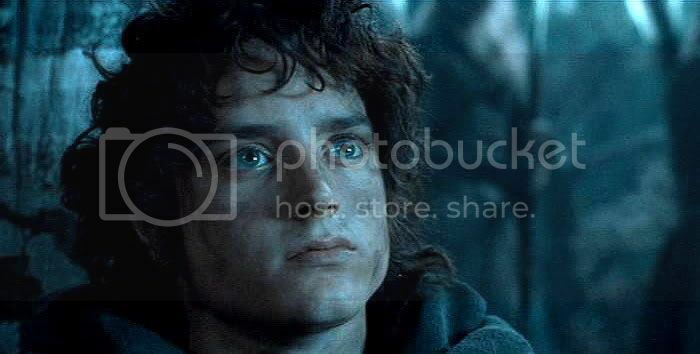 We see what Frodo sees, which is probably just concerned looks, but he sees them as suspicious, even condemning. I think that's meant to show just how low and mixed up he is feeling. No, it's not like that in the book, but it works for the film. Well, it works for me. Just as I am awed by Blue Lorien, even if it's entirely different in look and mood from the book. Thanks for posting (love your matching blue icon, too! ), Pearl. Stunningly beautiful screencaps, as always, Mechtild. 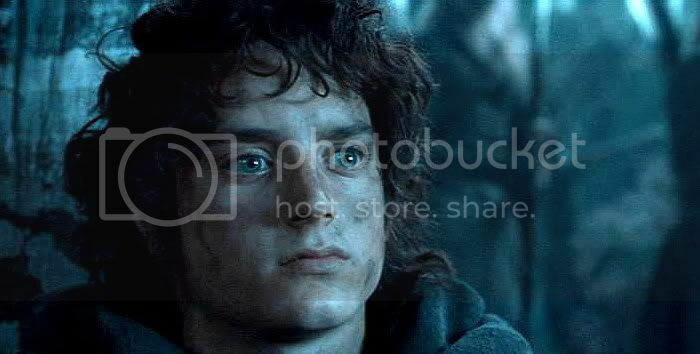 Yes, there is everything visible on Frodo's face here what has been mentioned in the comments: grief, guilt, anger, despondence. But, is it just me or do I detect a certain petrified look in his eyes, behind or beneath all the displayed emotions? Blossom called it in her comment an "almost detached demeanour" - I think maybe she and I speak of the same? 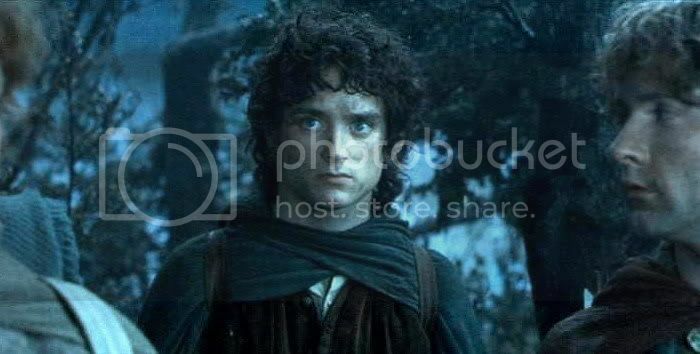 Frodo still seems to be in a state of shock. One part of him already has acknowledged what has happend, but other parts of his soul seem to have frosted all emotions - for the time being. Boromir is wonderful in this scene. He is indeed a great tragic character. I agree with Whiteling about those petrified feelings. 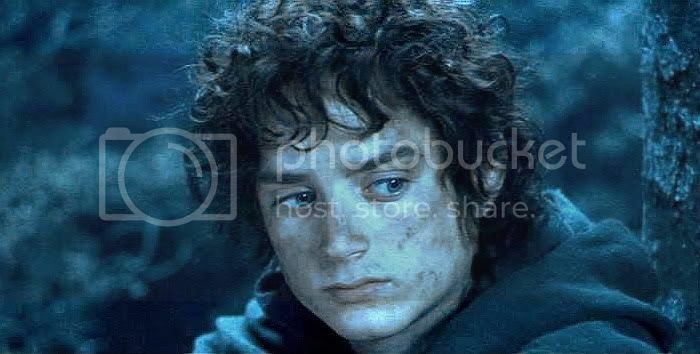 And actually, frosting over those emotions does seem to be a very typical response for Frodo. It's all internal with him. He processes everything on the inside (he's very much like me in this respect). No drama queen histrionics for this guy: he never draws attention to himself. He sits quietly at Bilbo's farewell party drinking wine. When in deep grief, he sits quietly and processes all his powerful emotions internally. Not for him the passionate sweet heart-on-your-sleeve impetuosity of Samwise. I love him no less for it. The writers were truly wonderful when they were exploring the tragedy of Boromir. I only wish they could have been that consistent and effective with some of my other favorite characters! Lovely caps and analysis as always. Hugs! Yeah, this was a stroke of inspiration. Since they worked so organically -- frenetically (one day you should read Sibley's bio of Peter Jackson if you already haven't - it's an eye-opener about the making of the film, and about film-making generally) -- it's perhaps due as much to luck or providence as their own design that Boromir should have turned out to be a character to love. And I wonder if they ended up writing it more sympathetically simply because Sean Bean was playing it that way, and, liking the way he was going, picking up on his cues. I wondered the same thing about the character of Aragorn. Mortensen's Aragorn is not only more flawed and vacillating than book Aragorn (which incensed some book fans, to be sure), he's more, I don't know, human and humane. I wondered if some of the writing decisions weren't based on their desire to capitalize on Viggo's particular qualities for angsty introspection and a strong empathetic sense. Beautiful Mechling – Thank you so much! Frodo is so painfully beautiful in these caps. I appreciate this scene very much, and I always blamed The Ring for Frodo’s misinterpretation of the looks he was getting, from the other members of The Fellowship. 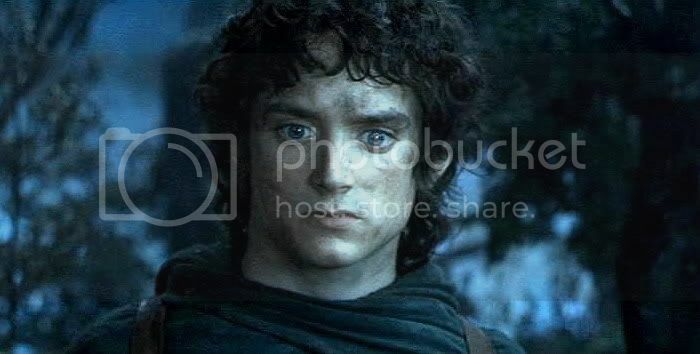 I felt The Ring was getting to Frodo in any way possible in order to further break him down. I think of Boromir as brotherly in this scene. Wonderful engrossing posts from you and your readers. Yes, the replies have been especially good, Este. They make it worth posting a little essay each time, which, I think, help provoke the extra thought. I always learn a lot more that way, too. I think that's an excellent idea, Este, that the Ring was acting to bring him to a low, suspicious state, but he could have felt that way even without the Ring, considering all that had happened. It's a splendid little scene, and I'm so glad it made the EE. These scenes of the Lórien admission from the EE are so intense and explicative of the development of the interplay among the Fellowship. Here, I don’t like particularly the filmic technique, these shooting are not homogeneous and far from perfection. But I can see why these scene were inserted in the EE: they tell a lot about the feelings of the different characters. The look exchange between Frodo and the rest of the Fellowship is beautiful. There are doubt and disorientation in the look of other hobbit, and Frodo seems timorous as hounded animal. He from the beginning had known that he was alone in the task, but in this scene we see that for the first time his experience of what will really mean to be alone in the quest. Thank you, Mechtild, for let us savour and relive LotR movie emotions. (...) Frodo seems timorous as hounded animal. He from the beginning had known that he was alone in the task, but in this scene we see that for the first time his experience of what will really mean to be alone in the quest. Wow. That's a powerful analysis of what's going on for Frodo in this scene. Your eye sees deeply. Thanks so much for posting, Estelanui! What you said at the beginning, about why you could see they left these sequences out, did you mean that the segments seemed edited together poorly -- that they didn't seem to flow or progress properly? Or that the scenes were simply poorly shot, camera-wise? All I can say is Poor Frodo. And poor Boromir. You know.. maybe I was distracted by Frodo but I never really noticed how kind Boromir was till I saw the movie. Since then when I read the book I feel for him SO much more profoundly. Yes, the films did very well by Boromir (*sniffle*). 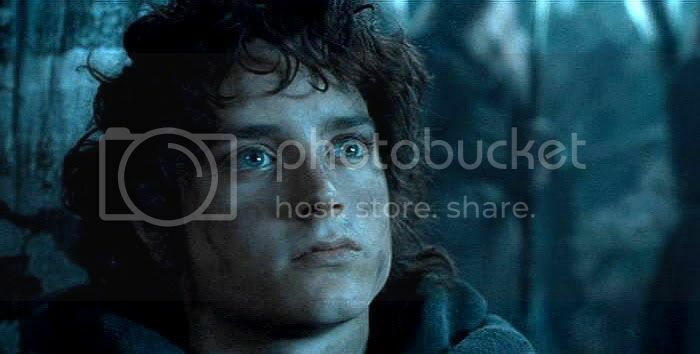 The look exchange between Frodo and the rest of the Fellowship is beautiful. There are doubt and disorientation in the look of other hobbit, and Frodo seems timorous as a hounded animal. He from the beginning had known that he was alone in the task, but in this scene we see that for the first time his experience of what will really mean to be alone in the quest.